Harringtons Adult Complete Rich in Turkey with Veg provides wholesome nutrition while containing no artificial colours or flavours, and no dairy, soya or added wheat. This diet helps to provide the conventional benefits associated with premium foods. Maize, Turkey Meat Meal (15%), Porridge Oats, Meat Meal, Rice, Peas (4%), Beet Pulp, Poultry Fat, Digest, Linseed, Minerals, Kelp (0.2%), Yeast (0.1%), Citrus Extract (0.04%) & Yucca Extract (0.01%). Nutritional Additives: Vitamin A 15,500 iu, Vitamin D3 1,350 iu, Vitamin E (alpha tocopherol acetate) 165 mg, Vitamin C (ascorbyl monophosphate) 50 mg, Iron lll Ferric Oxide 790 mg, Calcium Iodate Anhydrous 3 mg, Cupric Sulphate Pentahydrate 40 mg, Manganous Oxide 80 mg, Zinc Oxide 55 mg, Zinc Chelate 400 mg, Sodium Selenite 0.2 mg. Antioxidant (contains tocopherol rich extracts - a natural antioxidant). Protein 21%, Fat Content 10%, Crude Fibre 3%, Crude Ash 8.5%, Omega 6, 1.9%, Omega 3, 0.4. 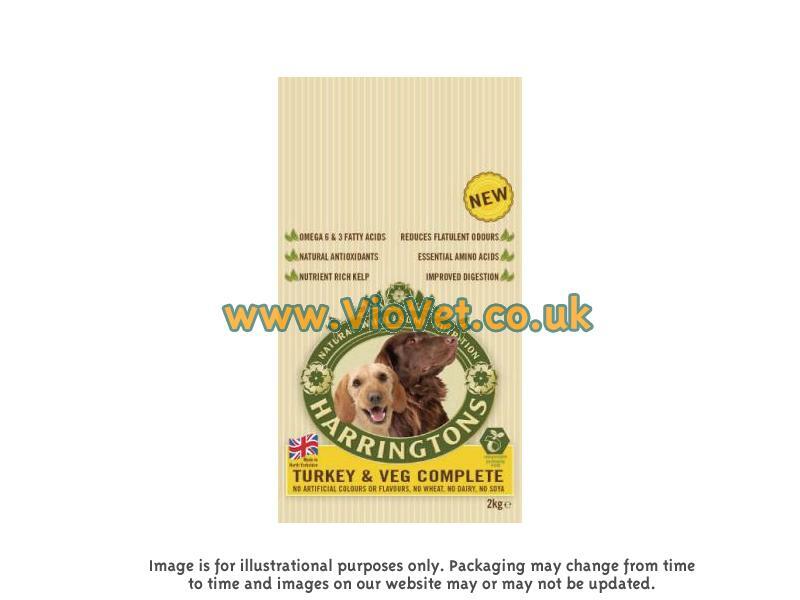 There are currently no questions for Harringtons Adult Complete Rich in Turkey with Veg Dog Food - be the first to ask one!